So this Sunday, we celebrated not only Mothers Day, but DH’s birthday. Now that I’m getting chronologically blessed, I do love a Birthday, but my favorite part is just being with family and friends. Presents? Not so much. I mean, I won’t turn them down or anything, but, really, just some time with loved ones is all I really want. Oh, and cake. There has to be cake, and it has to be good cake. Not from a box. Not from the corner grocery. Good cake. Home-baked cake. So, DH’s favorite Cake, which I have long known, but sadly have never baked, is German Chocolate. I like German Chocolate, but it always seemed…, well…, not really chocolatey. And much too sweet. 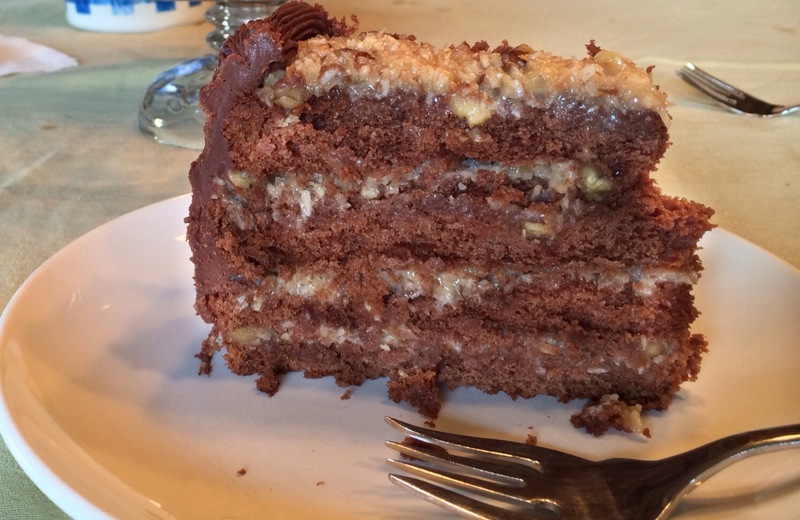 If you Google “German Chocolate Cake” what comes up for several of the initial entries is Dave Lebovitz’ cake. So I imagine that is the one to try. 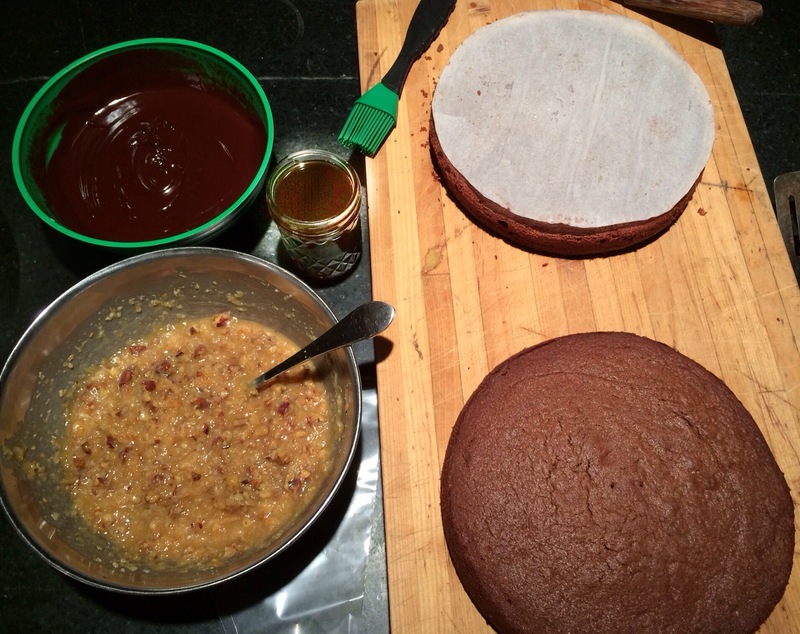 Dave Lebovitz’ German Chocolate Cake is unlike those too-sweet, not chocolatey enough German Chocolates of my past. It is perfectly textured, nicely chocolate flavored, with a not overly sweet filling. The bittersweet chocolate ganache frosting you may want to eat with a spoon, but resist, please! You will enjoy it much more on this cake! Now when you look at all of the elements that go into this cake, you may think it will take way too long to prepare it. But trust me, none of the parts is too involved or too difficult. While the cake is baking and cooling, you can easily prepare the filling, the syrup and the frosting. So go for it! No regrets ! First, prepare the cake batter. Preheat oven to 350F. Butter or spray 2-9″ cake pans. Line with parchment paper. 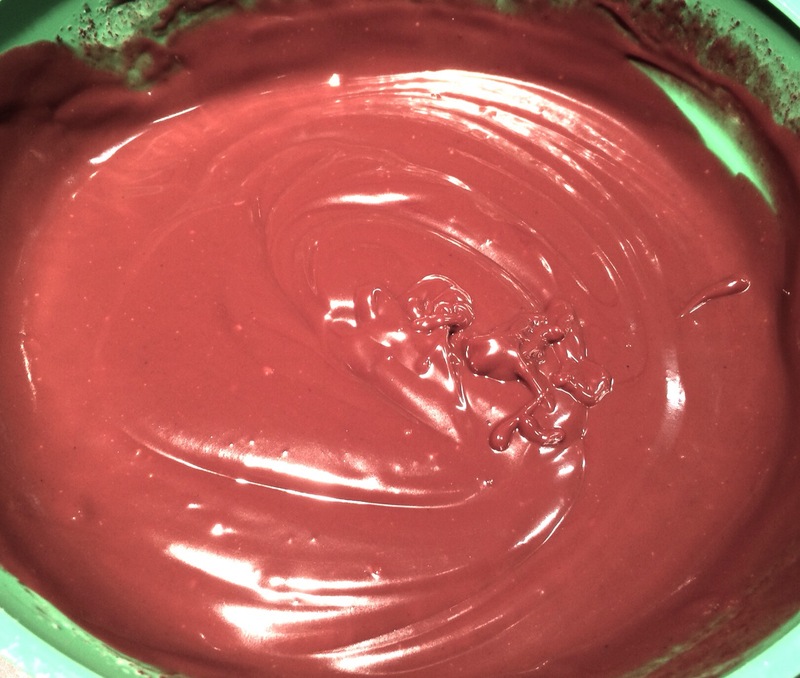 In a double-boiler, melt the chocolates with the 6 T water. Stir until smooth, than cool to room temperature. In a large mixing bowl, cream the butter and 1 1/4 c sugar until fluffy and light yellow, about 5 minutes. Sugar and Butter, creamed for 5 mins. Beat in the melted chocolate. Next, add the 4 egg yolks, one at a time. Sift together the next 4 ingredients. Mix half of the dry ingredients into the creamed butter mixture, followed by the buttermilk and vanilla, then add the other half of the dry ingredients. The mixture should be fluffy but relatively thick. In a glass or metal bowl, beat the 4 egg whites at high speed until they have soft peaks. Add remaining 1/4 c sugar and beat until mixture has stiff peaks. 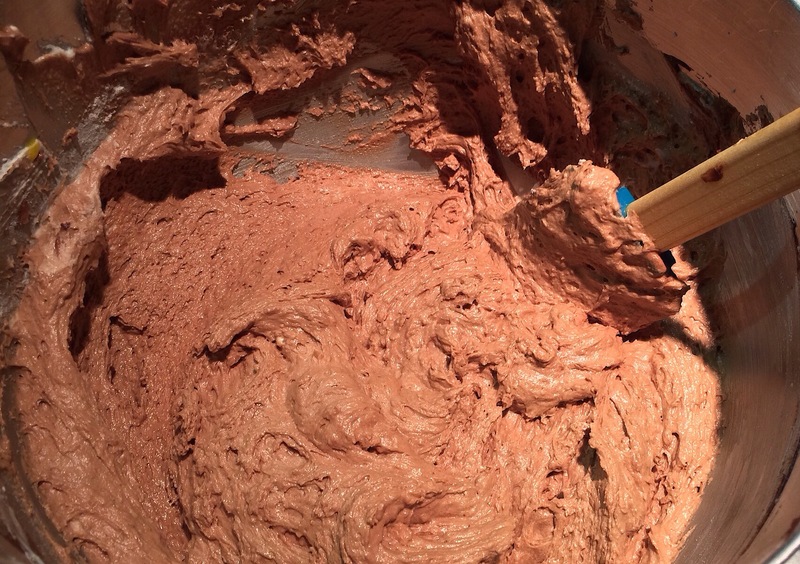 Using a rubber spatula, gently fold 1/3 of the egg white mixture into the batter, in order to lighten the batter. 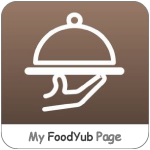 Fold in remaining egg whites just until any trace of egg white disappears. Batter should be lighter in color and texture at this point. Gently and evenly divide the batter into prepared pans, smooth tops, and bake 40-50 minutes, until cake pulls away from sides of pans and springs back when touched. Remove from oven, cool 10 minutes, then remove from pans to cool on a rack. While cakes are cooling completely, prepare the syrup, filling, and frosting. In a saucepan, mix together the cream, sugar and yolks. In a medium bowl, place the butter, salt, pecans and coconut. Heat the cream mixture until it begins to thicken. Using an instant-read thermometer stir constantly until temperature is 170-175F. It should be beginning to thicken at this point. Pour over the bowl of coconut-pecan mixture and stir until well mixed. Set aside to cool and thicken. Mix water, sugar and molasses in a small saucepan. Over medium heat, allow to boil, then simmer until slightly reduced. Pour into small bowl or jar. In a medium bowl, place the chopped chocolate, corn syrup and butter. Ina saucepan, heat the cream until just boiling. Pour it over the chocolate-corn syrup-butter. Wait 1-2 minutes and stir until smooth. Let cool to room temp. Using a serrated knife, slice the cooled cakes horizontally, so you have 4 layers. Gather the following in one place: cake layers, syrup, filling and frosting. Place the first layer on your serving plate. Brush generously with syrup. Measure 1/4 of coconut-pecan filling and spread across layer. Be sure to reach edges of cake layer. Repeat with remaining 3 layers. The only difference is that you don’t have to spread the coconut-pecan filling all the way to the edge of the top layer. Now you are ready to add the delicious chocolate frosting. Give it a good stir. Frost the sides of the cake, then add a decorative edge around the top layer with a piping tool. Serve cake the same day. Refrigerate any leftovers, but bring to room temperature prior to serving. Don’t refrigerate the prior to serving or the chocolate will become dull. It’s much prettier when shiny! Enjoy!